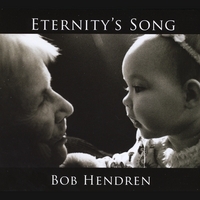 “Bob Hendren has arrived as a unique voice in Christian music. A prolific song writer, Bob has been busy crafting his music for many years and has quite a large body of work to show for it. His lyrics convey an inspirational spiritual message and the music will rock your soul. "From all outward appearances Bob looks like the proverbial "Everyman." Quiet, husband, father, hard-worker and survivor! His music however, comes flying out of the deep volcanic recesses of his heart with passion and energy. Along with some exceptionally musical friends each song finds Bob playing the guitar he has strung with six strings of love, loss, pain, yearning, joy and satisfaction. Listener, stand ready." Eternity's Song is tomorrow's classic Christian Rock. Picked this CD up about a month ago, and it's still the only one in my car player. A lot of catchy tunes on it (tracks 5 & 9 in particular for me), but track 2 (God's Love Will Endure) is the one that keeps running through my head throughout the day. Some really smooth bass and guitar, and the lead vocals blend effortlessly with the backups. Solid CD.